Pianist Dave Brubeck and his combo light up the night in their evening performance for the inaugural Festival program, 1958. 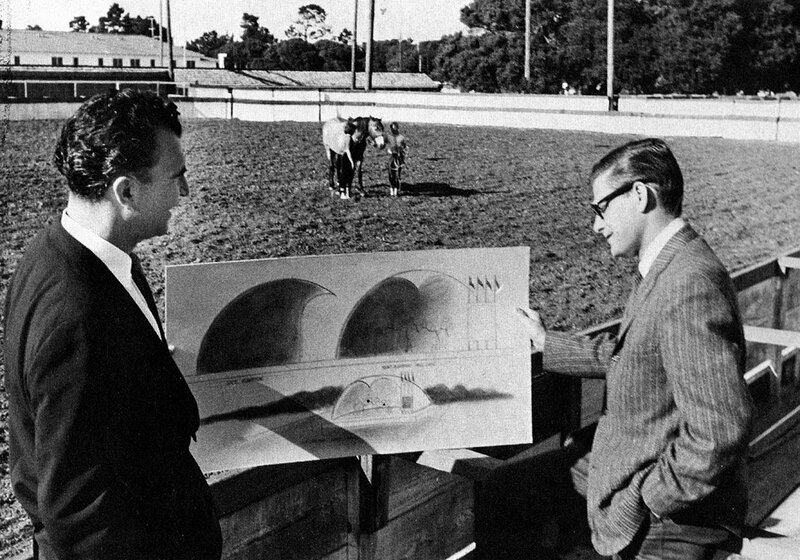 Dave Brubeck (left) and deejay Jimmy Lyons, two of the original founders of the Monterey Jazz Festival, eye the stage plan for their first Festival, in early 1958. It was 1957—the year of Miles Davis' Birth of the Cool, a landmark album that showcased the trumpeter and his influence on the rise of the 'cool' school of jazz emanating from the West Coast. 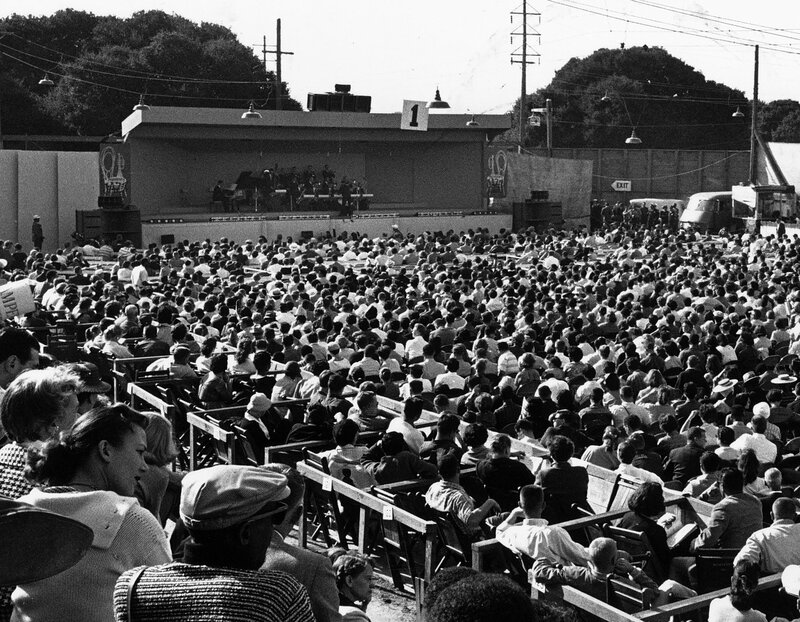 It was also the year Bay Area-based radio deejay Jimmy Lyons and journalist Ralph J. Gleason came together to consider warming jazz up in an outdoor setting, 120 miles south of San Francisco, along the coast, at the Monterey County Fairgrounds. 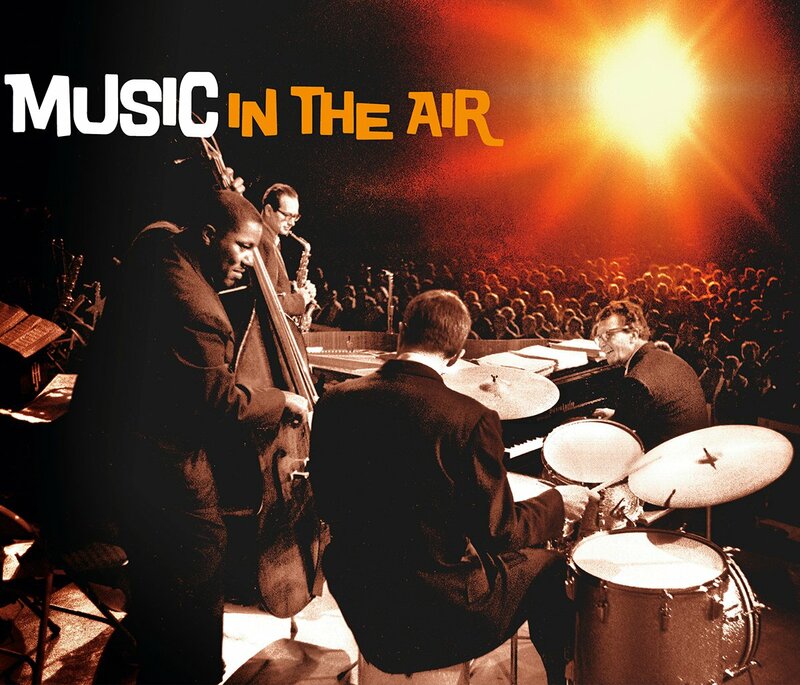 Their Monterey Jazz Festival, launched a year later, went on to become the longest-running jazz event in the world, far outlasting, while still embracing, that California 'cool' sound and so many other genres. "Everywhere else you play, you always run into something that reminds you of Monterey," said Dizzy Gillespie during the 1989 edition of the Festival. Gillespie's words were more than gratuitous praise. The extroverted trumpeter had emceed and performed at the very first Festival, and had eagerly returned, throughout the remaining 35 years of his life. "You realize that things that are for real will grow," he said, with a nod to Monterey, "and the things that are not will pass away." At its outset, the Festival seemed an unfamiliar combination of two trends of the 1950s: hanging out at county fairs, full of fun and food; and digging jazz music where you'd expect to find it, in nightclubs like those frequented by the era's Beats at San Francisco's North Beach. The Festival's two founders were well known among the era's Northern California jazz aficionados. Gleason, a New York native, had worked for the Office of War Information during the War, and had gone west after his discharge, writing stories (at $15 a pop, to start) about jazz and other music for the San Francisco Chronicle.